It finally happened. I made a dish that I never thought I would make without the step-by-step instructions from my parents. I made posole! 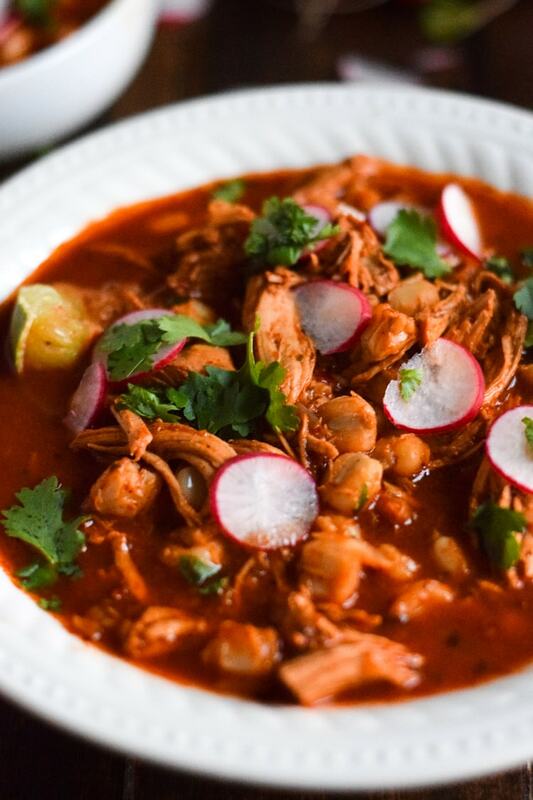 If you’ve never heard of posole, you’re not alone. It’s not a dish that is normally found at Mexican restaurants, at least not in the United States. and definitely not in Pittsburgh. And just so you know, I plan on making ALL those variations for you at some point. This is only the beginning. I’m getting excited just talking about it. Posole is kind of a big deal in my house. My parents don’t make it every day, every week or even every month. It’s usually made on special occasions when the whole family is together, like birthdays and holidays so my Mom or Dad can make a huge batch and feed everyone for days. And I mean dayyyysss. And while I’ve seen my parents make this soup probably hundreds of times by now, I had never attempted to make it myself…until now. I must say that I’ve definitely taken some liberties with my parents’ recipe. First of all, they’ve never made posole in the slow cooker. I, on the other hand, wanted to create this dish as easily as possible and so I knew the crock pot would be perfect for the job. Second, my parents’ usually make the red chile base specifically for their posole. But not me. Again, because I’m lazy, I used a batch of my Red Enchilada Sauce that I had in the fridge. My sauce is still homemade, it’s insanely easy to make and most importantly, it’s still has all the same flavors of the red chile broth that are in my parents’ posole. The right sauce makes a huge difference. 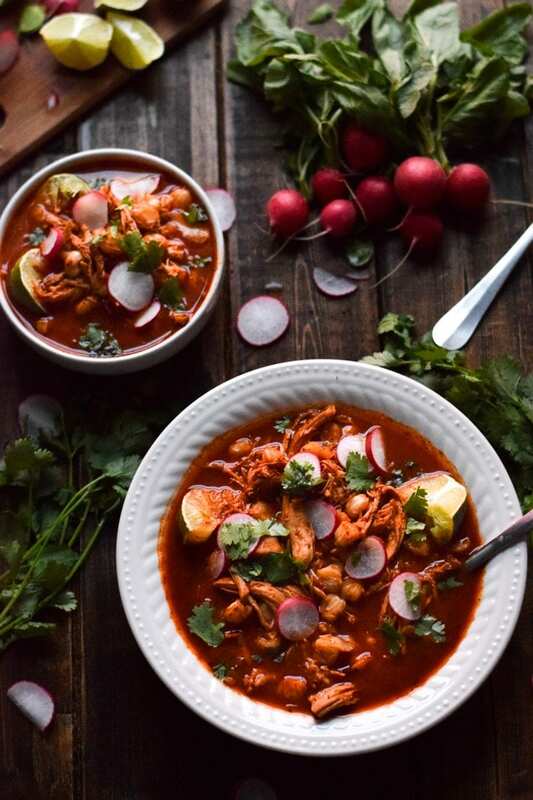 Once the crock pot posole is ready to go, it’s usually served with radishes, cilantro, finely shredded cabbage, limes, dried oregano, red chile flakes, white onions and even avocados. 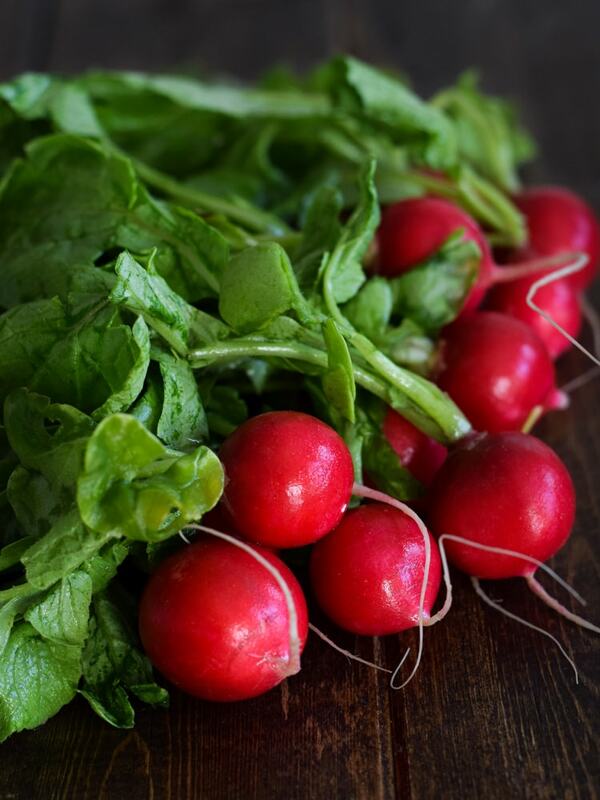 For these photos, I just used radishes, limes and cilantro, but I frequently also top it with shredded cabbage. It’s adds a nice crunch that is just delightful. I truly hope you enjoy this recipe as much as I do. Add the chicken, chicken broth, enchilada sauce, shallot, chili power, minced garlic, cumin powder, and salt to the slow cooker. Mix until well combined. Cover and cook for 7 1/2 hours on low or 3 1/2 hours on high. Using a slotted spoon, remove chicken from slow cooker and place onto a large plate or cutting board. Shred using two forks. Add in the shredded chicken, hominy and oregano. Cover and cook for another 30 minutes. Serve posole in bowls with lime juice, radishes, cilantro, finely shredded cabbage and other toppings. I’m about to make this recipe and was wondering what size crock pot you used. I used a 6-quart slow cooker. Easy and delicious! Do you have the calorie count per serving? Thank you. Hi Barb, I just added the nutritional information to the recipe. Hope that helps! I have made this recipe multiple times for my household, friends, co-workers, new mothers… The only variation I made was preparing and using the dry hominy from Rancho Gordo. The texture is much better than canned hominy. So happy I found your recipe–it helps me appear a better cook than I really am. Note: I used the left over water from soaking the chilis to steam collards. 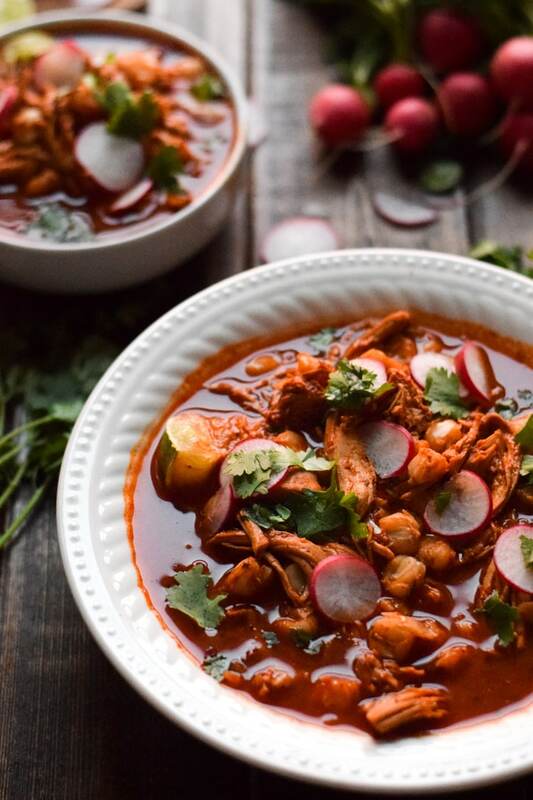 My go-to pozole recipe now! Next time I hope to find the chiles in Maine to make the enchilada sauce from scratch, but until then I’ll have to use canned. I also used frozen chicken breasts and pulled out the whole breasts to shred. So easy. So delicious. So happy! Just made this recipe and it’s almost done cooking! I made with pork instead and my boyfriend and I are so excited to try it! Thank you for the recipe. I made this for the first time last year. Even my picky mama liked it. I added avocado, which was a nice compliment. I wish I would have made it with the homemade sauce before my mom passed away in February, though. Gracias for sharing your recipe. I am so glad I found your website! We made this tonight and it was amazing. The depth of the flavors thanks to the homemade enchilada sauce was perfect! I only had chicken thighs on hand, so I browned those in a skillet and made the soup on the stovetop instead of slow cooker and it was delicious. Made this for my Mexican husband (he gives it a thousand thumbs up)! Authentic for sure! Yay! I’m so happy he liked it! Thank you. Found this receipe last night after craving pozole. It’s currently brewing in the crockpot, but from the little sample I’ve taken it’s delicious. I added some cayenne to it to give it more of a kick. I can’t wait to serve it to my boys tonight! Thank you! I found this recipe just in time! I’m having a Mexican potluck to celebrate my 24th birthday and I decided to make this. It’s currently sitting in the crock pot cooking up but it smells so amazing and I can’t wait to try it!! Thanks so much for this recipe. I am a paediatric urology social worker in Toronto and we started an annual “soup off” in the clinic’ last year in January. I searched for recipes for this year, and came across yours. I tried it out on with my family first two weeks ago (I doubled up on the enchilada sauce as you suggested, so took that step out of the final product:-) ) My son’s girlfriend is Mexican and lives in Mexico city, so he really enjoys when I try out Mexican recipes. It was a hit both with the family and in the clinic.There was a bit left and I took it to Ronald McDonald house to share with a patient from Africa. She loved it too! Woo! So happy you’re loving it! My husband is from Mexico. I made this Pozole last night exactly to the T.. I did not want to make changes because I know that could take away the authenticity of it. He said it was an A++. He loved it better than how his family makes it. It was spicy but he eats everything spicy or with hot sauce. I love spicy but have acid reflux. Honestly, it was so good , I decided to put up with my stomach issues and plan on eating more today. Thank You so much for sharing this recipe.